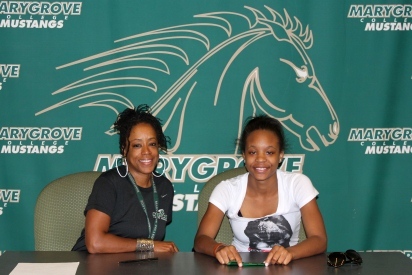 DETROIT, Mich. — Local standout Diamond Easton, a product of Detroit’s Allen Academy, signed a 2012-13 Letter of Intent to join the growing women’s track & field team at Marygrove College. Easton, a 5’2″ sprinter and mid-distance runner, also committed to participate in cross country for the Mustangs as part of a cross-season training effort. At running track at Allen Academy, Easton excelled in the 100m, 200m, 400m, and 4x100m events, en route to helping the team to a conference championship. The all-around athlete also participated in basketball and cross country in high school. On the court, Easton helped Allen Academy win a district championship. Coach Womack on Easton: Diamond is another solid addition for our program. Our program continues to grow because of the terrific young people we have in the program. I expect Diamond to work hard and have a successful career at Marygrove.